...< click on images for a closer look! In the Village of Basketeers, the soil is too rocky for farming and the sea too rough for fishing. Luckily, the grasses and reeds that grow nearby are ideal for making baskets, and a basketeer can weave anything - a house for a duck, a barn for a horse, or a carriage fit for a queen. Life is good in the village until the wind starts blowing harder day by day. First hats are whisked into the air, then fish fly straight out the ocean, and soon cats and dogs have to be tied together so they won't blow away. The townspeople have big ideas for taming the wind, but the wind is in no mood to be caught. Can little Elsa and Kip coax the wind into settling down, with the cleverest idea of all? 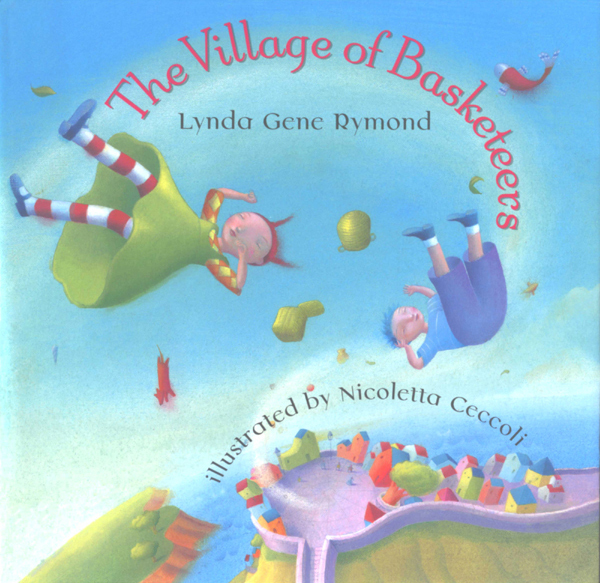 In this original tale, Lynda Gene Rymond creates an enchanting village that is brought to life by Nicoletta Ceccoli's mesmerizing illustrations, full of sunset color and bursting with energy.